On 18 December 2017, German Eurofighters of the Luftwaffe’s Taktische Luftwaffengeschwader (Tactical Air Force Squadron, TaktLwG) 31 “Boelcke” in Nörvenich have gained the air-to-ground capability to deliver the laser and GPS guided bombs GBU-48. This new capacity will enable the Eurofighters to assume the required multiple role of air-to-air and air-to-ground in the future. In time for the new year, the Luftwaffe will use the Eurofighter fleet with its new capability as ready for use. By arming with the GBU-48 precision bomb, the Eurofighters will be available as a fighter-bomber from January 2018 to NATO’s Rapid Response Force, the NATO Response Force. TaktLwG 31 is the first of four Luftwaffe Eurofighter squadrons to become multirole. 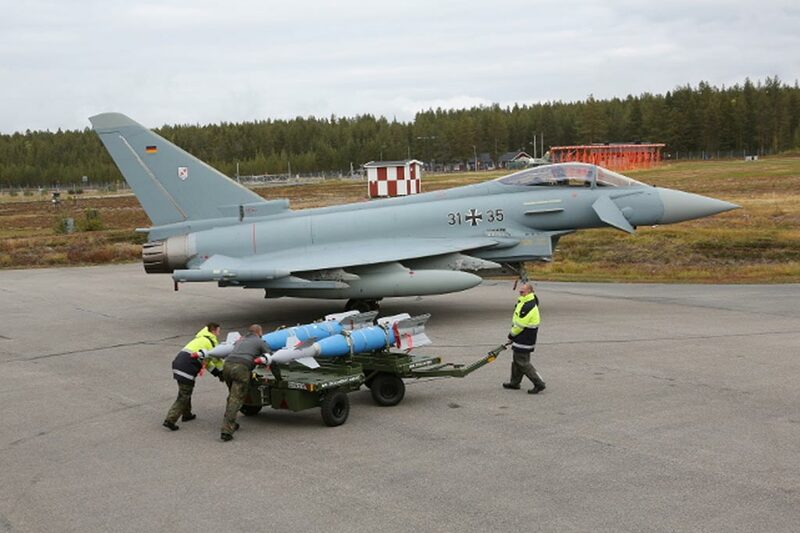 The squadron deployed Eurofighters to the Vidsel test range in Sweden in September. This test campaign with the precision weapon showed that the Eurofighter is able to perceive the air-to-ground capability. The test campaign on the Swedish practice area lasted several weeks. Safe operation of the weapon system was a top priority. The pilots must first get used to the flight behavior of the Eurofighter with the heavy armament, because software and electronics must function properly. Only then the real use take place: first on individual targets, later on several targets. The Guided Bomb Unit 48 (GBU-48) is a bomb controlled by laser or GPS. The GBU-48 is a precision bomb with a length of 368 centimeters and a weight of 504.5 kilograms. It has a range of up to 25 kilometers and hits its target with a deviation of less than ten meters. 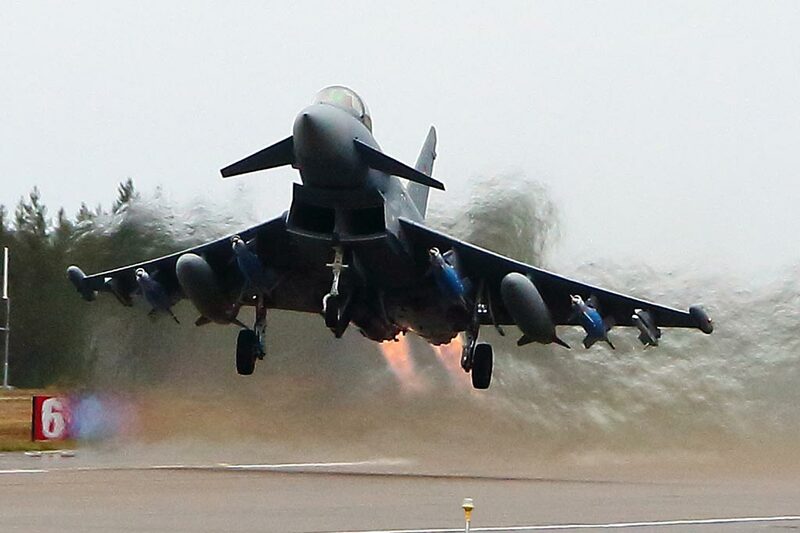 The Eurofighter can be armed with four GBU-48, which means an additional takeoff and flight weight of about two tons. 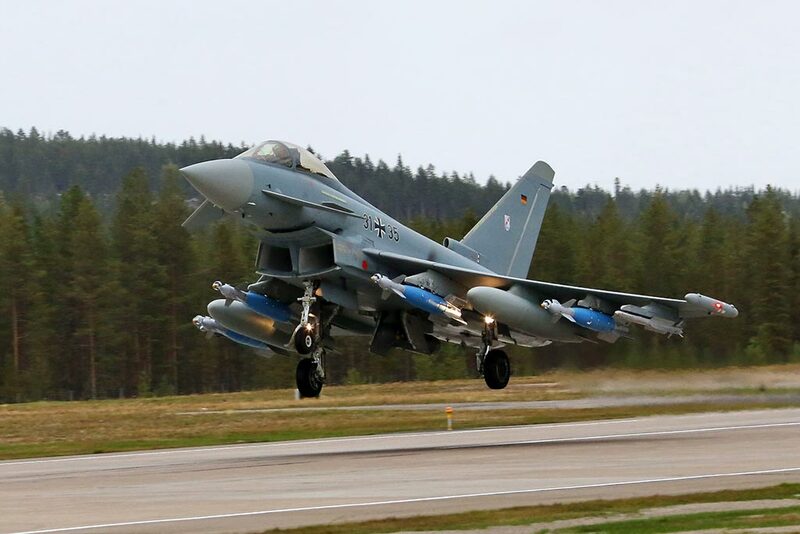 Therefore, at this year’s testing in Sweden, not only the dropping of the bombs, but also the changed flight behavior of the Eurofighter was tested. The GBU-48 is very precise and can be used in almost all visibility and weather conditions. The GPS can be used to predetermine the exact angle at which the GBU should hit the target. Essentially, a single GBU-48 consists of three components; the control unit with GPS sensor and laser aiming head, the bomb active body and the tail with stabilizers. At the front end is the freely movable laser sensor, which can detect laser reflections. Directly behind it sits the control unit with the GPS. This is followed by the variable control surfaces before the largest component, the bomb body, attaches to it. At the rear end is the tail with rigid stabilizing fins.